Microsoft Internet Explorer 1.0 officially released for the public on August 16, 1995. It was a completely remade version of Mosaic which Microsoft had bought recently, like many other software products and companies. The Internet Explorer 1.0 with limited functionalities came with the part of Microsoft Plus! for Windows 95 operation system. It was pre-installed as part of the Microsoft Plus! for Windows 95. One interesting fact about first release, The Internet Explorer team has started on this project with about five six people in 1995. 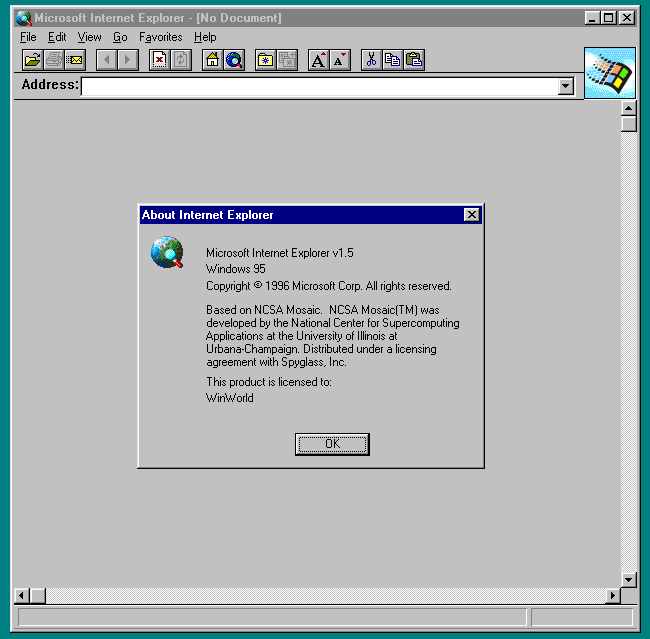 The Internet Explorer 1.5 was published a couple months later for Server and Workstation editions – Windows NT and added support for basic HTML 1.0. Microsoft Internet Explorer 1.0 is not supported and no longer available for download from Microsoft web site. However, you could find and download the final releases Internet Explorer 1.0 and 1.5 below on this page. In spite of the fact that Internet Explorer 1.0 not included, this software can also be installed on the original release of Windows 95, Windows NT, or Pocket PC. This site is provided solely as an independent fan site for web developers to check how a website is rendered by Internet Explorer and not officially associated with Microsoft, Internet Explorer, XBox, and EDGE. All related images, emblems, and logo belong to Microsoft and we claim no ownership.